Why choose Active Release in London? The body naturally produces scar tissue in response to injury. If scar tissue builds up, soft tissue that is designed to move freely is affected, often resulting in loss of strength, pain, a reduced range of motion, tingling or numbness. Scar tissue build up may also be due to over-use of muscles. Even simply minor issues, lack of movement, or lack of oxygen, can also build up scar tissue in your body. Scar tissue can also form when a strain or sprain is produced in your muscles and joints and doesn’t resolve properly. This scar tissue, if unattended, causes pain, weakness, numbness and movement dysfunction. Scar tissue build up is often found to be the cause of headaches, shoulder pain and knee pain to name but a few. 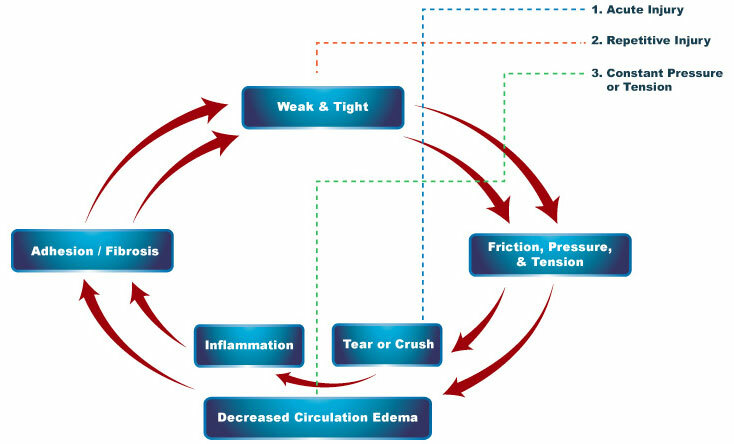 Soft tissue conditions can come from sudden trauma like pulls, tears, strains, sprains and collisions or from a build-up of repeated small tears via the cumulative injury cycle. Each type of collagen has different types of behaviour and respond to different types of stresses and strains. Healthy collagen is very supple and moves freely allowing ease of movement and contraction. Scar tissue collagen is much more rigid and blocks normal movement and contraction. Healthy tissue does not only move in single directions along fibre lines, but is fluid and mobile allowing you to move in all three planes easily.